Testesterone 500 supplement could be a powerful combination of herbal and plant extracts that with success promotes healthy levels of testosterone within the body. The formulation includes tribulis terresteris, Tongkat ali, and horny goat weed and mixed together they have been tested to optimize the amount of testosterone within the body. A mixed of herbal extracts which will will increase luteinizing hormone (LH). this is a pituitary hormone that instructs the body to turn on natural testosterone production. studies have shown the advantages of this include enhanced sperm production and motility in addition as increased testosterone production and testicular maturation. An adult men with low testosterone levels tend to experience the best benefits of testosterone 500 use as their natural testosterone have been declining yearly and also the extra stimulation of bigger output can cause much more dramatic results than for the younger user. Each bottle contains 60 pills. The usual dose is 2 pills a day, however you can safely take up to 4 pills per day if you feel its necessary. If you do experience any adverse side effects stop taking immediately and consult your doctor. If you suffer and health problems or are on medication check with your doctor first. 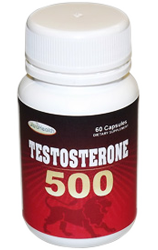 Our Testosterone 500 product contains tribulis terresteris, Tongkat ali, and horny goat weed.